Cloverbuds will enjoy helping to make molded candy hearts. The candy can be used as a meeting snack or wrapped in plastic wrap and given as a gift. Adult supervision is necessary. Purchase a heart-shaped candy mold and a 24 oz. package of white or dark melting chocolate. They are usually available at candy, craft, and/or grocery stores. To make the candy, use a double boiler or place a small pan (like a bread pan) on top of a pot holder or folded kitchen towel that has been placed inside an electric skillet. Pour about a half-inch of water into the skillet. Heat the double boiler or skillet to boiling then reduce the temperature to simmer. Overheating the chocolate will cause it to scorch. Place about half of the chocolate in the small pan. Stir the chocolate constantly as it melts. After the chocolate is melted, spoon it into the mold. Gently tap the mold on the counter top so that any trapped air bubbles will be removed. Put the mold into the refrigerator until the chocolate hardens (about five minutes). 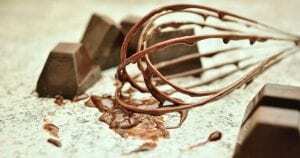 Remove the chocolate from the mold by gently twisting it or tapping it against the counter top. Enjoy!